Contrary to popular belief, getting a shotgun/rifle permit in New York City is not hard any even non-citizens can get one. First, you need to fill out some forms which can be found here. Download the forms, fill them out except for signatures and then print them out. You will need to bring original IDs, 4 passport photos, and some of the forms will need to be notorized while one form will require a witness. Photos should be no older than a month. Once you have all of the necessary paperwork, you will have a choice of either going to 1 Police Plaza in downtown Manhattan or Rifle/Shotgun Section in Kew Gardens, Queens. Both locations are open until 8pm on Monday, but, waiting in line and processing may take over an hour. Both locations had problems with their fingerprint scanner. However, 1 Police Plaza is bigger and actually has an IT division to fix things same day. 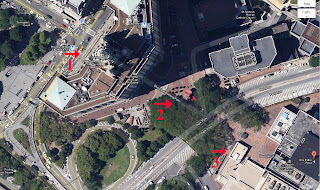 1 Police Plaza is also a lot easier to get to unless you live in Kew Gardens. If you decide to apply at 1 Police Plaza and are taking the subway, don't follow google maps as the directions you get are wrong. Go to the corner of Chambers St and Centre St and face the building marked Manhattan Borough President. It's on Centre St, has columns in front and a tunnel in the middle. You should see a red statue through the tunnel. Walk past the statue to the small building on the right with "Welcome to Police Headquarters" on it. You will need to walk through a metal detector so make sure your pockets are not filled with too much metal junk. Go to the back wall and take a picture of yourself for the pass. Walk out the back door and to the revolving door across. Get your pass on the left, walk past and all the way to the right. Licensing section is right near the public bathroom. Rifle/Shotgun section is easier to find since the building is right next to the subway station. Go in through the main entrance, go through the metal detector and to the elevator across. No need to get a pass. Take the elevator to B and follow directions to licensing. Application approval, for me, took two and a half months. It would've probably taken less time if not for the screw up at 1 Police Plaza because they're not sure how to process rifle/shotgun applications. On the other hand, at least their finger print scanner was working. Once you're approved, you'll get a notification to go pick up your permit for the Rifle/Shotgun Section in Queens. I took a car service going there and subway going back. From Brooklyn, both took about same time as the car service had trouble getting there even with GPS and charged $35+tip. I'd say you're better off taking the subway. When I was there, a guy who was applying was told to come back in a week because their finger print scanner was broken. Good thing I went to 1 Police Plaza to apply as getting there takes a lot less time. I'm just about to turn in my paperwork but have two questions. 1. Step number 14 on the website refers to "A notarized acknowledgment statement. (Form supplied by this office)". The downloaded application makes no mention of this form. Do you have to go to the office and then out and get the form notarized or do they do it there? Or is it part of the application that you download? 2. Can anyone be a "Witness"? Such as my wife. Page 5, Arrest Info, needs to be notorized. Affidavit of Co-Habitant also needs to be notorized, but that form is only required if you have no proof of residence in your name. Caretaker, wife can be both caretaker and witness. What are you planning on buying?